Sometimes choosing to limit yourself to recycled materials can make your building more interesting. These buildings are made from a wide range of reclaimed materials, from concrete pipes and discarded doors to plastic bottles and bags. The four-story Prahran Hotel in Melbourne, Australia, designed by Techné Architects and made using reclaimed concrete pipes. 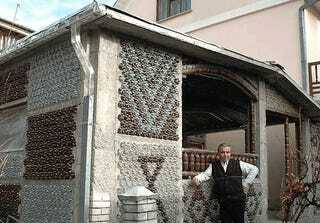 Earthquake-resistant Nigerian homes, built from 14,000 plastic bottles, packed with sand. The TuboHotel in Tepoztlán, Mexico, with rooms converted from concrete sewer pipes. It was designed by T3Arc, and opened in 2010. Ubuntu-blox, built from plastic trash for Southern Methodist University, Dallas, Texas. It cost only $250. A school made of plastic bottles filled with adobe, in San Pablo, Philippines. The material is much cheaper but three times stronger than concrete.